Institutional Review Blog: Psychologist Blasts "Taxonomic Chaos"
John J. Furedy, Emeritus Professor of Psychology, University of Toronto, has posted, "Implications for Australian Research of the Taxonomic Chaos in the Canadian Bioethics Industry: Après Moi le Deluge," originally presented at a June 2009 ethics conference in Australia. Though Furedy's expertise is in experimental psychology--a field outside the scope of this blog--his paper is relevant to the social sciences and humanities as well. 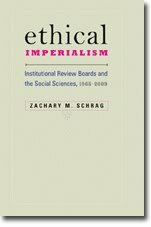 Furedy, who himself served for decades on ethics committees, argues that Canadian research ethics boards worked pretty well until the early 1990s. But since then bioethicists "have created taxonomic chaos by conflating such distinctions as the distinction between ethical and epistemological issues, or the differences among medical drug evaluation studies, psychological experiments, and sociological surveys." 1. "REBs have taken it upon themselves to judge not only whether the proposed research is ethical, but also whether it is scientifically valid. But research-design issues for a particular piece of research require a specific sort of epistemological expertise which most REB members do not possess." 2. "The Tri-Council committee has succeeded in persuading governments and universities to treat a sociological opinion survey and a drug evaluation study, as if they were all part of 'human subject research,' that can be evaluated by the same all-knowing REB, using criteria that may apply to medical treatment-evaluation studies, but that do not apply to most social science research." 3. Though the Tri-Council agreed to drop the term "code" (with its suggestion of mandatory rules), "it was made clear to REBs, that if a researcher did not follow the so-called "statement", the right to apply for funding would be denied, because the REB would refuse to accept the proposed research." senior investigators are likely to be able get their research proposals through, even though they know, in their heart of hearts, the significance of distinctions such as the one between ethical and epistemological or research-design issues. But for younger researchers, and especially those who are currently students, the distinction between ethical and epistemological issues has been conflated, and so they lack a memory of how research used to be conducted. So researchers of the future are likely to succumb to the bioethics industry. They will, in the epistemological sense, be corrupted by these developments. Current senior researchers, then, who are in control to-day, are acting like France's Louis XV, who was said to have said "Après moi, le deluge." As a historian, I applaud both the reference to the Bourbon monarchy and Furedy's emphasis on the need for historical consicousness. If younger researchers understand that scholars did not always operate under today's restrictive conditions, they are more likely to imagine alternatives. UT Knoxville's IRB Joins "Collective Mobbing"